Geographical distances keep my two brothers and I from seeing each other much so I appreciated the rare chance for all three of us to hang out for a long weekend. The Texas weather was wild at times, at least for this California girl (torrential rains, thunder and lightning, flooding and tornado watches and marble-sized hail! ), but we compensated with lots of good food, good talk and good movies. When we did get out and about, I, of course, wanted to do a little picking and when we passed an antique store, my brothers were happy to indulge me. It was one of those antique stores in a strip mall and had about 50 dealers or so. I love poking around these kind of stores trying to ferret out undervalued gems. Well after 20 minutes I had barely started looking and my brothers were done! NUTS! So after a few more minutes, and in the interest of sibling harmony, I called it quits too. I found plenty, but some of the prices made me gasp. 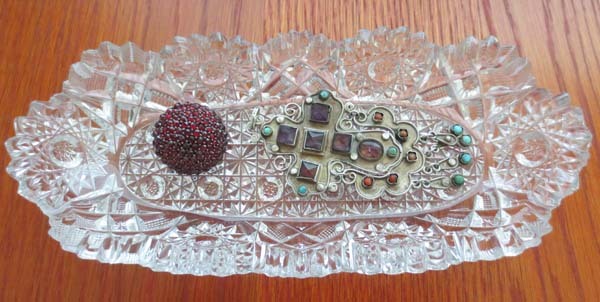 A signed Weiss rhinestone brooch of common design and size was $90. And though the dealer said she “could work with me on the price,” I knew it wouldn’t be close to any number I wanted to pay. Currently there are dozens of similar Weiss brooches for sale on eBay for under $30 and quite a few on Etsy as well. I am NOT a Weiss expert, but it seemed that this price was way out of whack with the market. I did get absorbed in rifling through boxes of old photos and found four in short order. 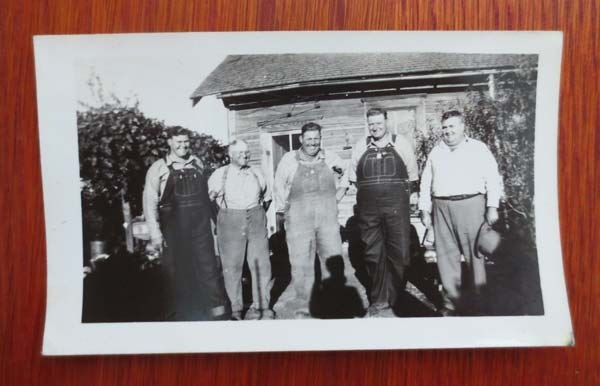 My first and favorite I call the “good ole boys.” Big, beefy farmers in bib overalls. They look related and I can picture some poor woman trying to feed them all. 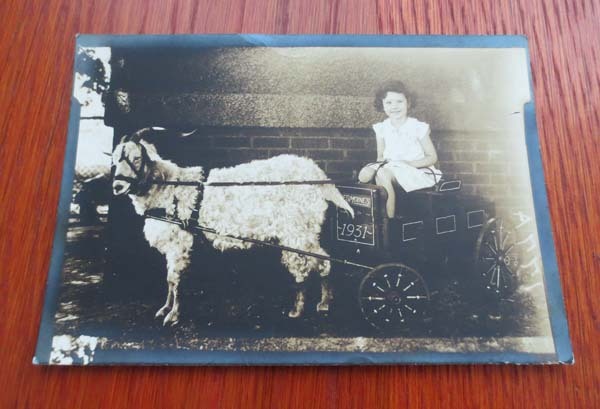 And I love the photo of the little girl being pulled in a cart by a billy goat (circa 1931). I also spotted a few small crystal dishes in a stall. 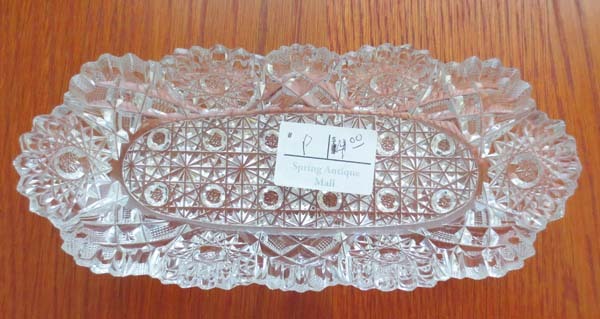 Now, here’s the thing, I think fancy crystal pieces are fussy and out of vogue, but I also think they are kinda purty. So when I saw this elaborate (and heavy) little relish dish for $4, I thought “Come to momma!” But at the checkout the woman rang up the dish for $14. HUH? I told her I thought the dish was $4. She looked at the price tag and looked at me and I could almost see the wheels turning…she thought I had altered the price tag! And yes, I’ll admit the price tag did leave a little room for interpretation, but I was 99% sure that $4 was the real price. I said maybe she could call the dealer to verify the price. She didn’t respond to that. 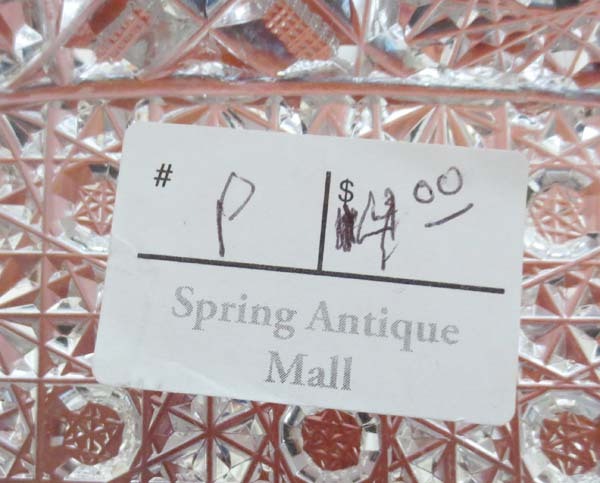 Then I suggested I could bring up a few similar crystal dishes from the same seller that were bigger and clearly marked only $6.50 and $7 to show her that this seller was selling crystal items at these prices. So, I brought up the other dishes and she looked at the $6.50 dish and said, “It has a little damage and that accounts for the lower price.” But my dish also had a few fleabites!!! In the end she sold it to me for $4 (I wouldn’t have bought it at $14. ), but I left feeling uncomfortable because I knew there was still doubt in her mind about the real price and the unspoken question, had I altered the tag? I rather wish she had called the dealer. The whole transaction took the joy out of this purchase. When we got back to my brother’s house I tried to “untaint” the dish by putting it to use! I think the jewelry I brought along looks good in it. On Sunday, I tried to redeem my Texas thrifting experience by going to an old standby, a neighborhood Goodwill thrift store. Well, I think you might be guessing the outcome…I wasn’t successful there either. It was slim, slim pickings…mostly clothes (which I’m not buying right now), generic drinking glasses and Made in China flotsam. 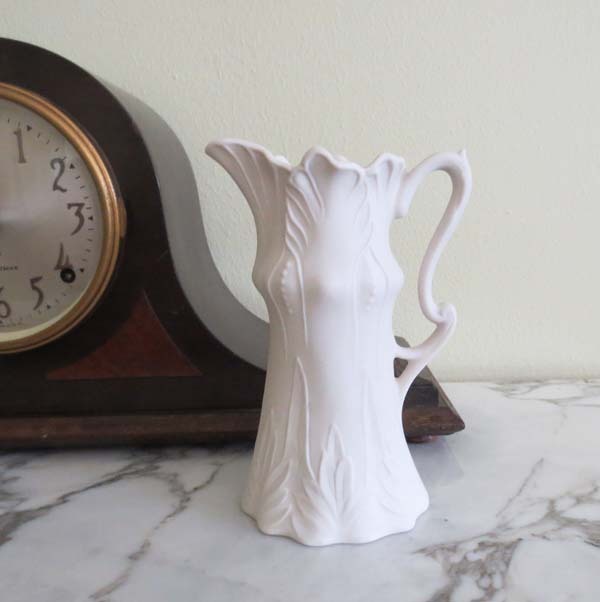 My only find (which I bought and managed to get home safely in my luggage) was a small, stylized bisque pitcher in excellent condition. How about you…any luck thrifting while on vacation?? ← What’s a “Few” Books?